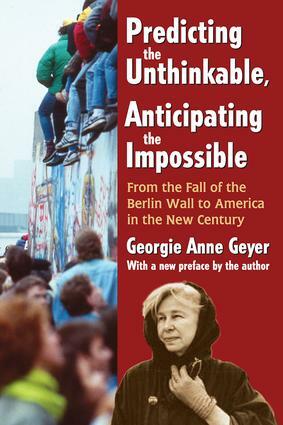 In the 1980s, most Americans scoffed at the idea that the Communist empire could collapse - but Georgie Anne Geyer was already outlining that probability. In the 1990s, the world was stunned by wars that raged across post-Yugoslavia and their viciousness - but Geyer on a trip to Belgrade in 1989, interviewed top officials and anticipated the conflicts. When 9/11 occurred, she used common sense and said, 'This was inevitable - the terrorists had already attacked the World Trade Center in 1993 and criminals always return to the scene of the crime. 'Geyer argues that while the United States was being praised everywhere during this era of 'indispensable power' as the 'greatest power the world has known,' it actually had started on the road to decline. It had won the Cold War, but had immediately embarked upon more Vietnam-like small wars of tremendous cost in Iraq and Afghanistan. Across the board, it was no longer paying its way, while its domestic culture was being vulgarized at every turn.This book explains how, when, and where these declines happened. Geyer studies the history of nations and of peoples, observes human nature, particularly as influenced by religion and ideology; and is a close analyst of the acts of men and women when they perceive they have been humiliated by others or by history. She warns Americans and journalists that we must anticipate the changes in the world before they are upon us and that we must employ predictions to strengthen our nation and its principles. Who Killed Sir Michael Rose? Should U.S. Troops Have Gone on to Baghdad? Seeking to Change Society by Force? Shanghai Full of Life, But Going Where? Is There a New Revolution Under Way in Iran? How did We Ever Get to be So Incivil and Vulgar? Without Even Trying?